Paige and team roll into Dawson City, while I (Cody) watch with excitement! Sorry for the hiatus in updates. This computer musher was called in to be a handler in Dawson. Now that we have the team back on the trail, I will do my best to keep up with the action. Paige left Dawson last evening at 5:25 pm PST after the mandatory 36 hour layover. She left with 12 solid dogs. Axl Rose was left with us because he had some knots in his hamstring that we were not able to massage out completely during the 36 hour layover. Dawson is the only place along the trail where outside assistance is allowed. In Dawson, almost anything goes. The handlers are allowed to have a camp all set up for the team when they arrive. We can build an open ended, un heated shelter for the dogs filled with lots of straw and we set up a heated tent for the humans. We put Paige to sleep in the hotel room for the first 16 hours or so she can catch up and have a rested head on her shoulders and the handlers get to work giving each dog lots of special attention. When the dogs first come in they go through a thorough veterinarian exam. They are then fed a warm meal already prepared by the handlers. We then look them over again to make sure the vets did not miss anything. Notes are taken for each dog on a big white board and all the dogs get their harnesses taken off and a new dry coat put on. 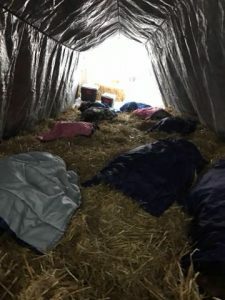 We put them into the big dog tent full of straw and once they are bedded down we put a quilted blanket over them to retain even more heat to help their muscles rest and rebuild faster. We then go to work massaging each dog. Those with sore or tight muscles get liniment applied to those areas and some areas such as a sore triceps get a sweat coat applied with chemical heat warmers in them. Dogs are allowed to sleep for about 5 hours before we get them up, walk them to stretch out and go to the restroom. Then we feed another high calorie/high fat meal and repeat the entire process. We do that 6 times until the 36 hours are up. Paige and I would like to give a huge thanks to Chris and Megan for working so hard in the dog camp to get everyone ready to roll. The only dog that was still stiff at the end was Axl, he had a sore hamstring muscle. It loosened up a bunch, but with 150 miles until the next dog drop, a musher does not want to chance taking a dog that may not be 100%. Anti-inflammatory drugs are not allowed on the race, but once a dogs is dropped they may take some. So Axl got his doggy aspirin and looks smooth and loose now. Which is a good sign. He’ll take a few days off and then begin to train for Iditarod. The dogs sleeping in the dog tent. We use quilted blankets to help them stay warm so their muscles can relax. My job was not only to help in the dog camp by being there while Paige rested, but also to help Paige get physically and mentally strong before getting back on the trail. 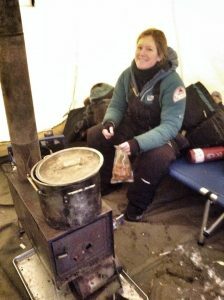 When a musher rolls into Dawson they are so tired, hungry and dehydrated. Once they hand over the team and share the important info we need to take care of the team, they usually melt into a puddle of exhaustion. I made sure she ate, reminded her to drink lots of water and a couple beers, made her stop telling stories from the trail so she could get sleep, dried her clothes last minute with a hair dryer, taped wholes in gear, looked over her sled, tightened bolts and replaced her brakes, basically I was a mom with a beard. Lots to do in Dawson. Paige packed her sled and sat down to do a mental run through of the next 150 miles. The team all hooked up and ready to hit the trail to Eagle. During the 36 hour a well-oiled handler team can make the dog team spring back to life. Stiff muscles showing limps in a dog turn into smooth and flexible gaits again. Dogs who lost weight can noticeably gain weight in that period and major hydration of the dogs can be achieved. A couple years back, the layover in Dawson was shortened to 24 hours for a trial. 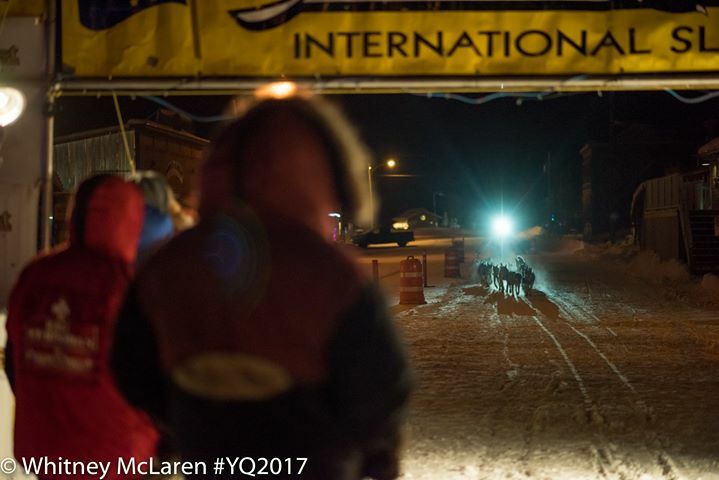 It was unanimously decided by finishing mushers that the 24 hours was not enough time to properly care for a dog team at this point (halfway) in the Quest under the temperatures and terrain that the Quest runs through. Most teams in Iditarod take their 24 hour layover much earlier like around 300 miles and it seems to work well for that set of circumstances. The mushers gave their recommendations to the rules committee and they changed it back to 36 hours for the dogs. So what is going on in the race now? This next section is 150 miles long with the next checkpoint/resupply at Eagle. Race rules also require that mushers take a mandatory 4 hour rest in Eagle in order to have an official veterinarian exam of the team. Earl and Sandy host the only hospitality stop along this route which is roughly 50 miles from Dawson City at Clinton Creek. 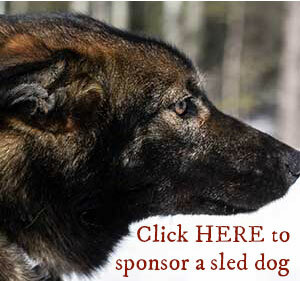 They open their homestead on the banks of the Forty Mile River to tired mushers and their teams. Without a doubt, they offer some of the finest hospitality in the North. A warm bed or couch and all the homemade food you can eat. Thanks Earl and Sandy for taking care of our mushers. I’m bummed I can’t visit this year. Normally there are 2 main ways that mushers choose to run this section. The main way that front runners have run this the past few years is to split the 150 miles into two equal runs. Mushers taking this plan will camp right around the US/Canadian border. Being that it is a river in the wilderness, there is no formal border station for passport check and there is no wall currently, but they do have the border marked with a big banner to make you feel special. There also is no warm log cabin and no moose stew. It can be hard to take this option especially when the temperatures are dropping to -40F in the next few days. Brent chose this option again this year. So did Allen, Matt and Ed. Those using this method may rest a little longer being that it is two long runs stacked together or if they are feeling good, may cut the rest. 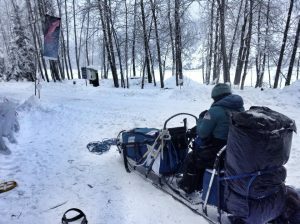 Brent appears to have taken a 5 hour rest and has just arrived as the first musher in Eagle. The other main tactic has been to start more conservatively after the 36 hour break and do the 150 mile run into three 50 mile runs utilizing Clinton Creek and then camp on the trail somewhere around the 40 mile bridge where the Taylor highway crosses the river and teams then follow the un-maintained road bed into Eagle. Paige has taken. Paige took a little over 4 hour rest there before getting back on the trail. Katherine had an almost a 2 hour lead over Paige leaving Dawson, but left Clinton Creek just a few minutes ahead of Paige closing the gap between them to 2 miles currently. Will Katherine be doing the same run plan as Paige or will she try the third option? Or have they teamed up to share some comradery and cheer along the long cold and sometimes very lonely path to back to the road system 250 miles away at Circle. The third option that is rarely seen here has emerged as possibly a very competitive one if it doesn’t backfire. Hugh opted for running 50 miles to Clinton Creek and getting a rest before pushing on and doing 100 mile run to Eagle. With this move he appears to be closing the gap on Brent and will be the second musher to reach Eagle. It is an interesting plan and in some ways it may be better than the two 75 mile runs. It give the dogs a shorter run to warm up and get back in groove after such a long break in Dawson, then attempting the 100 once warmed up. 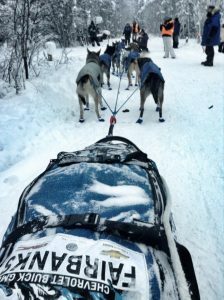 Brent has more rest in the bank still, so if the trend continues between these two mushers as it was at the beginning, then Brent should be able to stay ahead of Hugh. We’d like to thank Clear Alaskan Glacial and the Gillam family for sponsoring Squid Acres Kennel for the past few years. 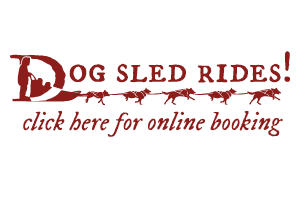 They help with race expenses and supply locally sourced and bottled drinking water that use on the races for mushers and handlers. They have been very generous and we appreciate their support. If you to buy bottled water, look for their products. Either Clear Alaskan Glacial or Alaska Glacier Water. Next post: What’s for dinner? The Musher Meal Menu.